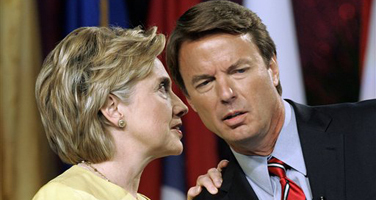 John Edwards ripped into Hillary Clinton during an interview Friday over connections between her senior campaign strategist Mark Penn and the private security company Blackwater USA. A subsidiary of Penn's lobbying firm Burson-Marsteller helped Blackwater CEO Erik Prince prepare for his appearance before Congress this week. In an AP interview, Edwards likened Penn to former Bush aide Karl Rove and argued that his Blackwater ties show that a Clinton presidency would "replace a group of corporate Republicans with a group of corporate Democrats." But the Edwards campaign has its own connections to Iraq contractors. Edwards' senior pollster Harrison Hickman is a senior partner at a firm called Global Strategy Group, which represents Lukoil, the first major oil company to stake a claim in Iraq after US forces invaded in 2003. Global Strategy Group also represent General Electric. The company known for owning NBC and producing light bulbs also happens to be one of the largest defense contractors in the U.S., according to FEC reports.